Moisture content is an important indicator of quality in dried fruit, both for in-field drying and in processing center operations. The traditional method for moisture content measurement, described in the Materials and Methods section below, is both destructive and time-consuming. 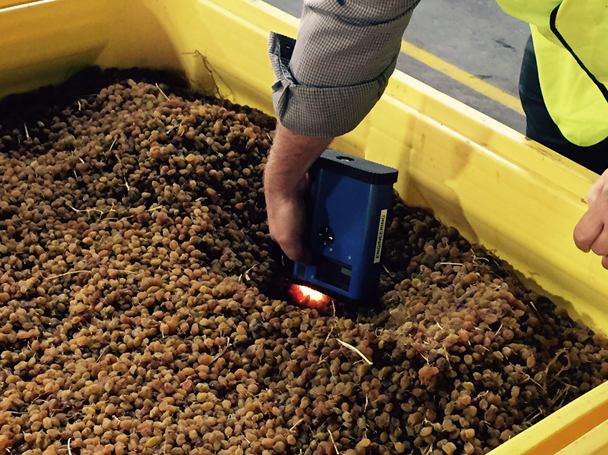 A study was conducted with the F-750 Produce Quality Meter for non-destructive measurements of moisture content in sultanas, using 42 lots of fruit in calibration. Reference values were assessed with the Dried Fruit Moisture Tester (DFA of California). The F-750 was calibrated using Model Builder Software. The F-750 Produce Quality Meter estimated moisture content of sultana fruit with a calculated root mean square error of prediction of +/-0.59. In August 2016, 42 lots of sultana were selected from incoming field bins. Spectra were collected using the F-750 and the range 729-975 nm used by Model Builder Software to correlate the F-750 spectral signal and corresponding moisture values. The fruit were then destructively measured for moisture using the industry standard procedure of mincing the sample lot, followed by an electrical resistivity and a temperature (thermocouple) measurement using the Dried Fruit Moisture Tester (DFA of California) with a look up table relating these values to moisture content (e.g. Kagawaa). The resulting regression data was analyzed for linearity, root mean square error, and leave-one-out cross validation error to determine the applicability and accuracy of the created model. A second population of 18 sultana spectra were measured and used to independently validate the calibration. Figure 1. Fruit presentation for measuring sultanas in a bin with the F-750. 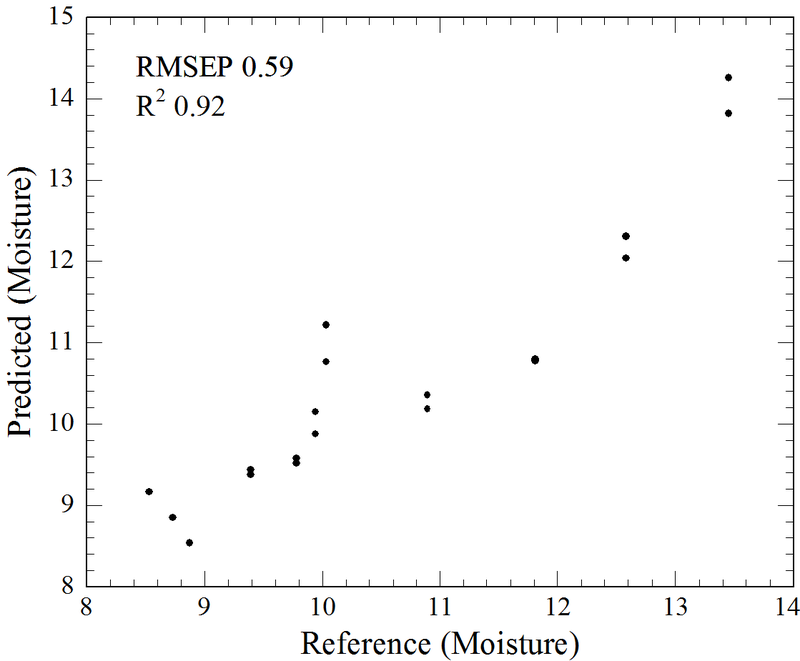 A strong correlation existed between spectral data and collected reference values, with a model prediction R2 of 0.92 for moisture content of sultanas. Figure 2 displays this correlation and demonstrates the consistency of measurement with an independent dataset. The Root Mean Square Error of Prediction (RMSEP) for the validation set was of 0.59% moisture, illustrating the accuracy of the created model. This value represents a measure of the expected accuracy when the unit is used with future unknown samples. The RMSEP is equivalent to the expected standard deviation of errors. Figure 2. (A) F-750 prediction value against reference method value of moisture content in sultana. 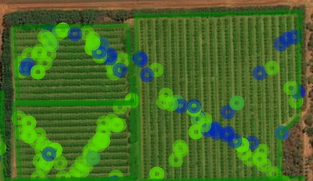 (B) GPS based mapping of field measurements. The F-750 Produce Quality Meter can be used to non-destructively estimate moisture in sultanas. This method may be applied in the field for estimation of the drying process time, or in processing centers. In the field, the geolocation and mapping app of the F-750 allow users to keep track of measurement location and in time may be used to make repeated measurements to estimate drying rate. In processing centers, measurements of moisture content can be used in assessment of stored bins (surface layers can absorb moisture from atmosphere) and for on-the-go measurements around drying tunnel settings.